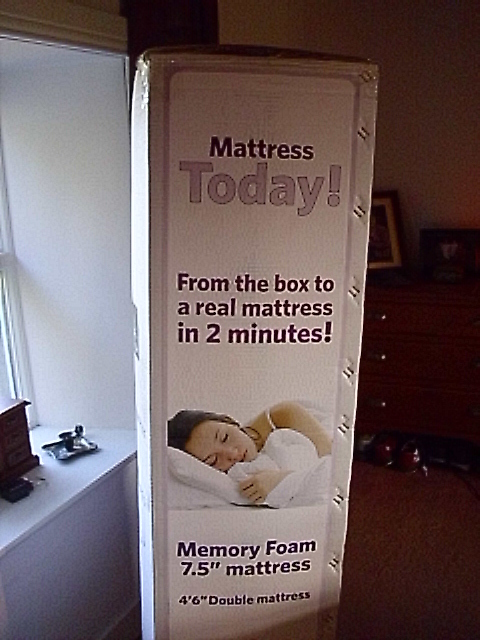 Believe it or not, there is a full size double mattress inside this box!. The people who pack em must have angel dust instead of sugar on their breakfast cereal!. We had a credit not from Cost Plus Sofa’s, after buying a new chair last New Years Day and finding out it was too big for our house. 9 months later we eventually found something we actually wanted. A lot of their stuff is really badly made. Anyway, ìt is the most comfortable mattress ever!. Do not purchase one if you have to get up early for work though!. Return to Kilronan’s Walled Garden.